Here is another inspiring tale that I bookmarked some time ago and then forgot. Coincidentally, like the previous post, its subject is a uniquely creative folk artist. I read about Bamboo Charlie in a memorial published in the L.A. Times in September, 2012. Twenty years ago, a homeless Texan named Charles Ray Walker noticed a bamboo grove along a narrow stretch of land by the Los Angeles River in Boyle Heights. The property owner told Charlie he could stay there if he kept the place clean. On the strip of land, about 40′ x 200′, squeezed between a parking lot and a warehouse, Walker grew fruits and vegetables. 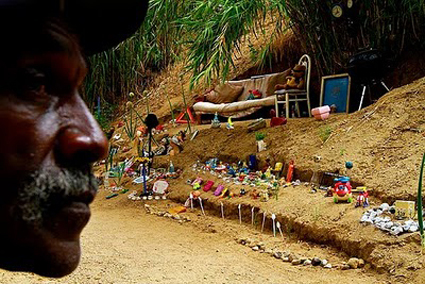 He carved stairs into the bare slopes and decorated them with hundreds of discarded toys and signs. 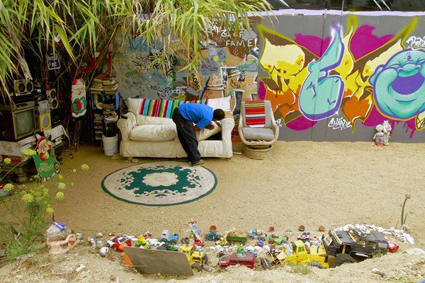 He built a shack under a tree, with a TV, bed,and sofa, and then he invited guests to visit: graffiti artists, children and their parents, musicians, police officers, and homeless friends. He assembled a library out of salvaged books, including best sellers and one called The Semi-Complete Guide to Sort of Being a Gentleman. Bamboo Charlie was featured on the front page of the L.A. Times in 2010. That pride may have contributed to an early death. He suffered greatly from ulcers during his final years, but insisted he was fine when friends suggested he see a doctor. On Aug. 26, 2012, a young friend named Teyuca found him dead in his shack, of what the coroner determined was heart disease. He was 61. This entry was posted in art, Article, Culture, Imagination and tagged art, Bamboo Charlie, Culture, Folk Art, imagination. Bookmark the permalink. Most interesting. People don’t have to live as others do to be happy or successful. He certainly seems both of those. Thanks for telling me about him. I admire his tenacity and sense of self. Me too, Rosi. He reminds me of characters in several adult fantasies I read long enough ago that I can’t remember their titles. Of course he lived with one foot in the world of fantasy, so it’s probably no accident!